The debate over how to manage the flow of the Missouri River has changed dramatically. It's gone from preserving water levels for spawning fish and nesting birds to conserving water so there's some next year. Sioux Falls, S.D. — South Dakota Gov. Mike Rounds is asking all of the states along the Missouri River to conserve water. Parts of South Dakota, Montana and even the Rocky Mountain region are experiencing the fourth year of a drought. The forecast calls for it to continue. Rounds says the river levels are nearing the point of "navigation preclude." That means river levels are so low in South Dakota that the entire river basin must conserve water, and the eight-month navigation season would be cancelled. That could cost the barge industry tens of millions of dollars. Rounds says it's better to conserve water now. "This cannot be accomplished without all of the states actively participating," says Rounds. "Working with the Corps of Engineers in perhaps modifying target flows during this coming spring, summer and fall." Rounds is proposing holding back more water in April, and delaying the start of the navigation season until May 1. He says taking this approach this year will guarantee a navigation season next year. It appears South Dakota is offering a compromise solution in the fight over water, and a way to avoid future lawsuits. For the last several years the state has sued the Army Corps of Engineers over its management of the Missouri River. The Corps of Engineers did not return phone calls for this story. 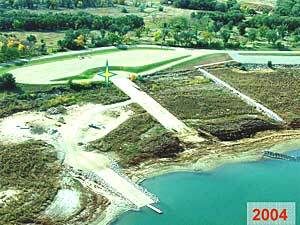 When water levels are high, there are 32 boat ramps on Lake Oahe, the largest reservoir in the Missouri River system. John Cooper, who heads the state's Game, Fish and Parks Department, says the department spent more than $5 million in the last three years to keep just 14 ramps open. He predicts only half as many ramps will reach the water this year. "We're down to the very fine bottom line which is our inability -- if the Corps' most likely forecast is reached -- our inability to accommodate the boating public this year is going to be severely limited," Cooper says. Cooper says the state is already seeing a hit economically due to lack of fishing access. In 1996, fishing along the river had an economic impact of nearly $26 million. In 2003, that number was less than $9 million. Low water levels are also a concern for drinking water systems. Several will have to extend intake pipes to reach the water. Officials say it'll cost more to pump water and treat the water. Farmers who use the river for irrigation are also having a difficult time getting water. Many of the bays where pumps are located dried up, and 41 percent of the farmers with water rights did not irrigate last year. Gov. Rounds says he's asked the Army Corps of Engineers to adopt the conservation plan. He says he's now asking other states along the river to pressure the Corps to conserve water before there's a crisis.